A popularly market in Asaba Delta State called “Cable Point Market” was yesterday wrecked by fire outbreak suspected to be due to electrical fault. It was gathered that three persons who attempted to put out the fire sustained various degrees of injuries, as the fire was beyond what they could tackle.Residents said they have been taken to a private hospital where they are currently receiving treatment. Mr. Ogbueshi Joseph Nwandu, another eye witness blamed the fire on poor electrical connection, adding the victims were lucky to have escaped death. Investigation revealed that in the past few weeks, residents of Cable Point Quarters have been apprehensive, following the continuous sparks of cables on the electric poles in the areas whenever there was power supply. One of the security men in the market, Nnamdi Paul, said the fire broke out after a prolonged sparks from the electrical cables’ switch boxes that were connected to the market building. Traders whose shops were razed, one of them, Alhaji Lade Lawal, expressed shock about the incident, saying he had just stocked his shop. 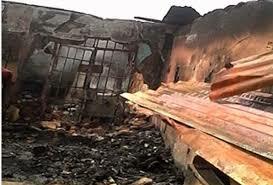 In his reaction, the state Commissioner for Special Duties, Mr. Chika Ossai, said the situation was was unfortunate, promising that the government would find the cause of the fire and prevent a recurrence. Officials of the fire service in Asaba who spoke anonymously said they arrived the scene after the fire had wreaked havoc on the market.